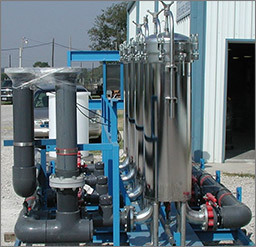 Progressive Water Treatment offers a complete line of Industrial Water Filtration products for commercial, industrial and municipal application, including carbon, multi-media, sand, greensand, inline mesh strainer, and cartridge and bag filtration, to name a few. Systems are custom designed and built for each application. Media filters are used to remove particulate matter from water. There are several types of media filters, including gravity and pressure filters. Multimedia filtration is a well-established technology and is a standard system used in water treatment..
Inlet water is introduced into the upper freeboard of the filter. Water flow is from top to bottom. The bed is typically several feet deep and consists of layers of various grades and types of media. Media are selected for the feed water characteristics and are specified in the Equipment List. The primary zone of filtration is the top third of the bed. The most important characteristic of the media filter is that filtration occurs within this primary zone. Filtration is not just a surface filtration, but also an in-bed filtration. This characteristic of filtration offers a number of advantages. Standard production units consists of 100 lbs. working pressure FRP tanks (up to 63” x 72”), and steel tanks (66”D and above), tested to 150 lbs. On larger units, there will be five low pressure drop valves used to perform the steps of backwashing, fast rinse and service.